I went to Fraser Hart in Solihull earlier today and tried a few watches on. 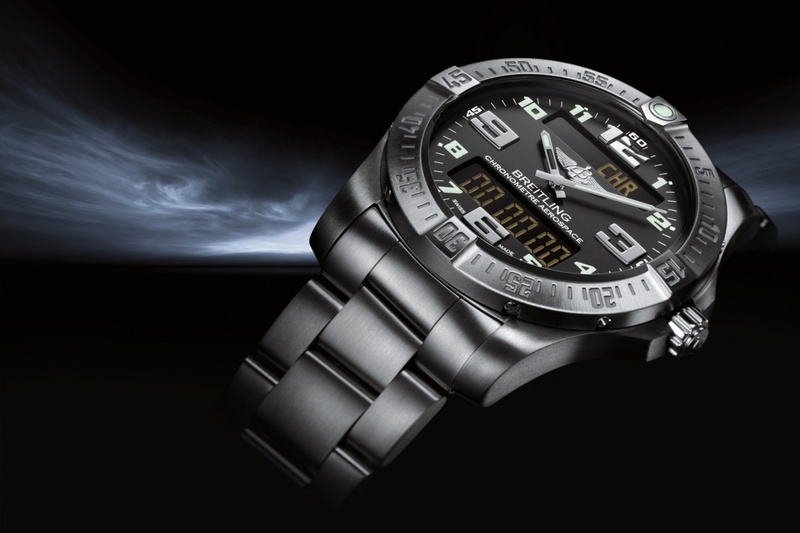 In truth I have my eye on a Breitling Aerospace Evo. I have wanted this watch in its various version for well over 5 years. I remember vividly, seeing one on the wrist of a helicopter pilot at a heliport in the south of France. Grey faced on a black leather strap and I was literally in awe of it. I have tried it on several times over the years but never had the money to get one. I have now started saving in earnest for one. However, the latest version the Evo, has gone up in size a touch to 43mm, so I wanted to try one on again so that I would not be saving for something that turned out to disappoint on the wrist. Today saw me in Solihull shopping with my Mum, so I took the opportunity to try it on in Fraser Hart. I also tried on, the blue faced Rolex Milgauss and an Armani grey faced chronograph. The Breitling seen above and retailing at £3150, was all I hoped it would be and the slate grey dial, (or more correctly “Tungsten Gray” as Breitling call it) looks very classy indeed. Subtle, tasteful and a change from the er… “thunder black” dial. The titanium case and bracelet made it as light as a feather and very comfortable on. I loved it, as simple as that and so the saving continues. Next on the wrist was the Rolex Milgauss (yours for £5800). This to my eyes is a stunning watch. Blue faced with a green sapphire crystal which subtly enhances the blue dial and reveals itself as an ever changing ring on the edge of the dial. For me this is the best juxtaposition of dress watch elegance with sporty intent, I have seen on a watch. Appropriate then for just about all occasions. Oh and it fitted on my wrist beautifully. Sadly though at that price this is a watch I can only ever dream about. And then there was the Armani fashion watch. A quartz, mineral glassed, grey faced, grey leather strapped chronograph. A 40mm case and a suggested retail price of £179. The looks of this watch are frankly fantastic. Grey face on a grey strap works beautifully and frankly there are very few on line photos that do this watch justice. It really is a beauty and not being too big it wears elegantly on the wrist. I want one, but I must concentrate on the Aerospace fund first. So there you are, If you are a pensioner, just registering with Match.com, get yourself an Armani watch if you want to impress the ladies! Categories: Armani, Breitling, Rolex | Tags: Armani, Breitling Aerospace, evo, Milgauss, Rolex | Permalink. If I am honest, I have always resisted the charms of Rolex. Yes I like them, yes I admire and respect the brand, but I have always been a bit immune to them. More of a Breitling Man. It is the same with Omega, great brand, great watches, but I always seemed to see them on the wrists of salesmen and especially car salesman. It got in my head, I’d see an Omega, look at the guy, look at the suit and think “salesman”. Totally irrational of course, totally unfair both to Omega and to salesmen the world over – an honest job to be proud of, and an honest watch to be proud of. It is just me, I’d look at the watch and trust me the word “existential” would never enter my head, I’d see one and a herd of rhinoceroses would invade my head, I’d hark back to my student days, think of Ionesco and his exploration of existentialism and see a herd of rhinos and spot one with an Omega on his horn. No as a symbol of existentialism an Omega does not cut it. Rolex fell foul of the same irrationalism in my head. Don’t ask me to justify my love for Breitling then, it will be as preposterous as my immunity to the charms of Omega and Rolex – I’d fluster and bluster and ending up shouting, “Biggles” at you! 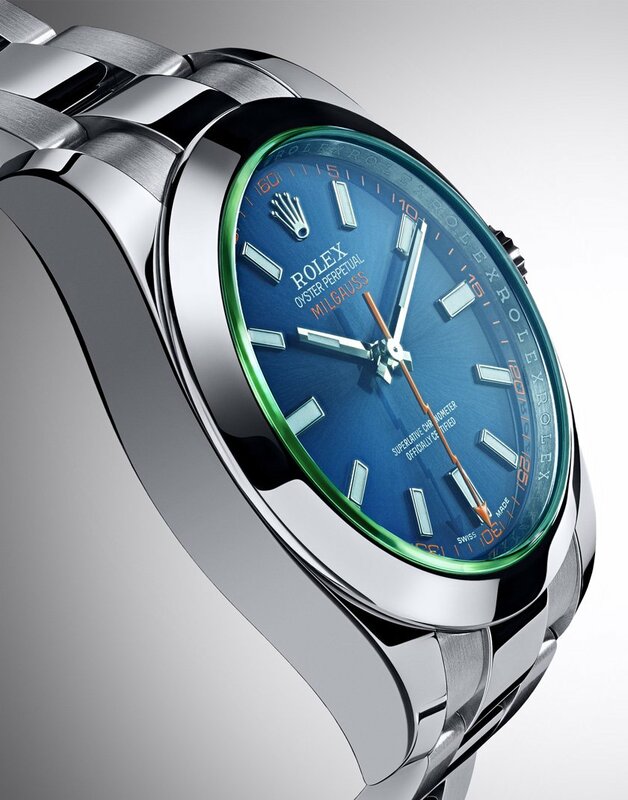 This latest version of Rolex’s charming Milgauss range however, has pierced my armour, exploded inside my heavily defended tank of resistance and blown away all of my defences. Frankly, I am smitten, in love, a love sick teenager once more, I am Romeo and Milgauss is my Juliet. If my life has just one more watch to fall into my arms, to rest contentedly on my wrist, then let it be this Milgauss Rolex, with her beautiful face adorned with the most lovingly applied make up, in hues of blue and green. Rolex is presenting a new version of the Oyster Perpetual Milgauss with unique and symbolic aesthetics. 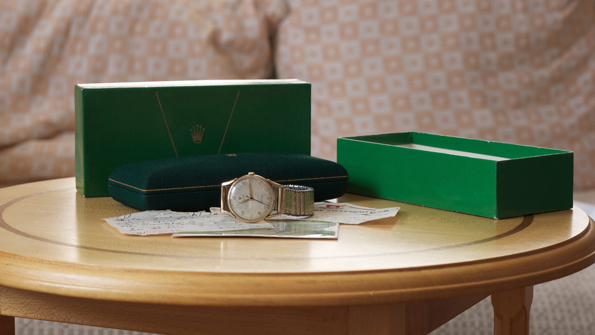 Its green sapphire crystal marked a first in watchmaking when it was introduced on the Milgauss in 2007. Now this crystal is combined with an electric blue dial, an allusion to the emblematic lightning-bolt-shaped seconds hand and the watch’s technical purpose as a paramagnetic timepiece designed for engineers and scientists in the 1950s. Seen through the green sapphire crystal, the Z blue dial takes on a powerfully attractive magnetic hue. 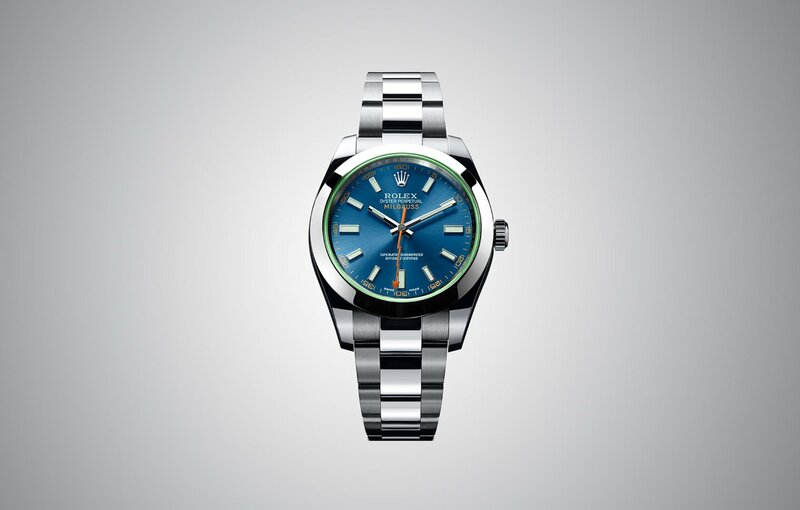 Ever since its launch, the Milgauss has remained an avant-garde watch. It was created in 1956 for engineers and technicians who are exposed in their work to magnetic fields which disrupt the performance of mechanical watches. It was designed to resist strong interference of up to 1,000 gauss, hence its name – mille being French for thousand – while maintaining its performance and precision as an officially certified chronometer. A pioneer in magnetic resistance, it became known as the watch worn by scientists at the European Organization for Nuclear Research (CERN) in Geneva and gained a reputation as the ultimate watch of science and technological progress. Several innovations contribute to its resistance to magnetism. The first line of defence is a shield made of ferromagnetic alloys which surrounds the movement within the Oyster case, an invention patented by Rolex in 1954. The second line of defence involves two of the movement’s key components, the oscillator and the escapement, which are made of innovative paramagnetic materials developed by Rolex since the 2000s. The 40 mm Oyster case of the Milgauss, guaranteed waterproof to a depth of 100 metres (330 feet), is a paragon of robustness and reliability. The characteristically shaped middle case is crafted from a solid block of particularly corrosion-resistant 904L steel. The fluted case back is hermetically screwed down with a special tool exclusive to Rolex watchmakers. The winding crown, fitted with the patented Twinlock double waterproofness system, screws down securely against the case. The crystal is made of virtually scratchproof green sapphire. The waterproof Oyster case provides optimal protection for the Milgauss’s high-precision movement. The Milgauss is equipped with calibre 3131, a self-winding mechanical movement entirely developed and manufactured by Rolex. Like all Rolex Perpetual movements, the 3131 is a certified Swiss chronometer, a designation reserved for high-precision watches that have successfully passed the Swiss Official Chronometer Testing Institute (COSC) tests. It includes Rolex-patented components to guarantee the level of resistance to magnetic interference for which it is named. The escapement of the Milgauss features a paramagnetic escape wheel made of a nickel-phosphorus alloy. This component is produced using a micromanufacturing technology (UV-LiGA) that is entirely mastered in‑house. The oscillator, the true heart of the watch, has a blue Parachrom hairspring patented and manufactured by Rolex in an exclusive alloy of niobium and zirconium. Insensitive to magnetic fields, the Parachrom hairspring offers great stability when exposed to temperature variations and remains up to 10 times more precise than a traditional hairspring in case of shocks. The Oyster bracelet of the Oyster Perpetual Milgauss is very secure and comfortable to wear. It is equipped with a folding Oysterclasp, designed by Rolex. It also features the ingenious Rolex-patented Easylink rapid extension system that allows the wearer to easily increase the bracelet length by approximately 5 mm, for additional comfort in any circumstance. Categories: Rolex, Watch Blog, Watch Brands | Tags: Milgauss, Rolex | Permalink. My Mum’s brother – Uncle Roy – aware of my passion for watches has given me two of his watches an Omega and this Rolex Precision. It dates from 1961 and comes with original boxes, original guarantee and original receipt. Currently the watch, in gold case with gold case back, is not working so the next step is a service and a clean to breathe new life into this fantastic gift. Methinks it might be worth a tad more than the original price of Thirty seven pounds five shillings and sixpence! 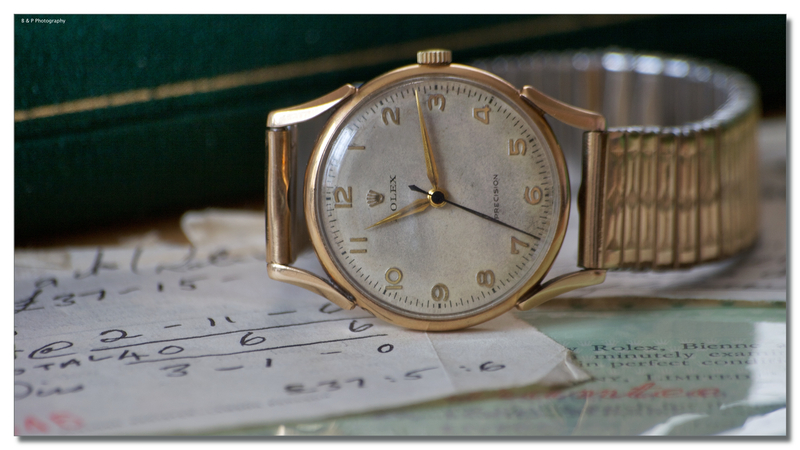 Oh and for the record the receipt from Watches of Switzerland shows that back in 1961, Uncle Roy got a 7.5% discount on his Rolex! The watch was my Uncle Roy’s 21st birthday present so I feel very proud to be the second owner of this wonderful family watch. Categories: My Journey Through Time, Rolex, Watch Blog | Tags: Rolex, watch, watches | Permalink.